One can never have too many hero shooters. Now normal shooters are great for engaging campaigns and fun competitive modes, but if we’re just looking at the multiplayer side of things, hero shooters typically provide a more engrossing experience. Instead of a nameless figure with an assortment of guns, you get to be an interesting character with a specific role or purpose. This is one of the reasons I enjoy playing Motiga’s Gigantic. 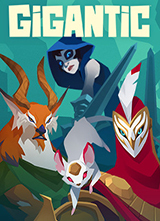 Gigantic is a free-to-play shooter with an interesting set up. 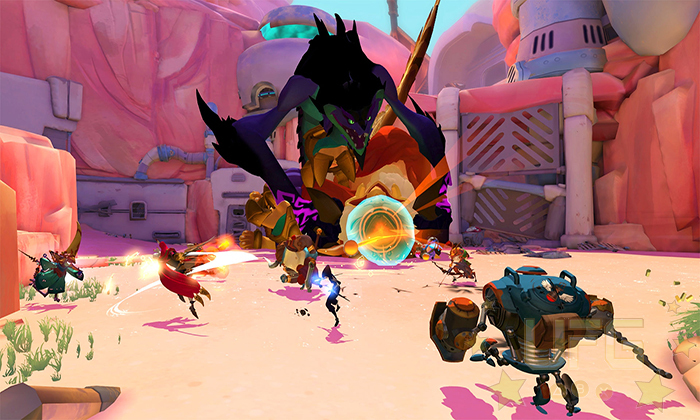 The game pits teams of five against one another in competitive matches with the goal of destroying the opponent’s Guardian. These behemoths are way too powerful for the players to defeat independently, instead require they perform different feats to power up their Guardians. Eventually, the fully powered Guardian will attack its rival, incapacitating it so players can damage its core. Provide the right amount of damage and the match is won. I’ve simplified things of course. Motiga wasn’t content with just having players kill one another so they added some elements found in MOBAs. While there are no items to buy, Heroes will still level up over the course of a match. There are no specific lanes to hold or parades of minions to assault, but there are contested places on the map and non-player-controlled allies. The goal is to promote strategic play over random chaos; because only one Guardian can be fully powered at a time, certain actions become more or less beneficial to a team as things progress. That’s all and great. Unfortunately, 90% of the time is spent killing other players. Despite having multiple ways of cultivating energy for a Guardian, subduing your opponent produces the best outcome. I believe this is due to the balancing of characters and the lack of clearly defined roles. I love how varied the heroes are, from their overall design to individual skill sets. For the life of me though, I can’t figure out Gigantic’s meta. The game doesn’t do a good job explaining what the roles are. Take the Assassin, Tripp. She can quickly dispatch opponents but must flee afterwards or risk dying herself. Makes sense given her character class. Yet, these same hit-and-run tactics are used by Ramsay, a Fighter, due to his low defense. Here we have two different melee based characters who are supposed to excel at a given role. Instead their roles blend together; outside of their moves, there isn’t much difference between Tripp and Ramsay. So why not make Ramsay an Assassin or Tripp a Fighter? Pakko is an extremely cute Bruiser who is all about controlling the battlefield. When it comes to doing real damage though, he isn’t the best choice. This is in opposition to Lord Knossos, a Bruiser who is one of the hardest hitting characters in the game. This makes me feel like Pakko would be better suited as a Tank. Then there’s the actual Tanks and their likeness to the Bruisers. My point is that there doesn’t seem to be rules that govern how to use each character. This structure of gameplay is good for players who like a particular hero but aren’t fond of certain roles. It also leads to disproportionate teams, with players picking similar styled characters. Having three Tanks and two Healers equals an uphill battle. You won’t die very quickly but you won’t be able to kill the other team either, even if that one healer does decent damage. The team that communicates and works well with one another has the best chance of winning. They’ll call out their targets, summon the right pets, and fight to protect their controlled zones. That said, with so many moving parts it can be difficult to sort how well a team is doing. Before you know it, one of the Guardians has enough power to launch an attack. The only real determining factor, again, seems to be the kill count. The good news? Gigantic is still a blast to play. Most of the characters are well designed and I like how their skills work together when attacking or defending. The fast-paced matches are full of explosions with colorful energy blasts and particle effects filling the screen; it’s entertaining to say the least. Gigantic is all around charming. And while it won’t overtake the likes of Overwatch in popularity, it’s certainly worth investing in. 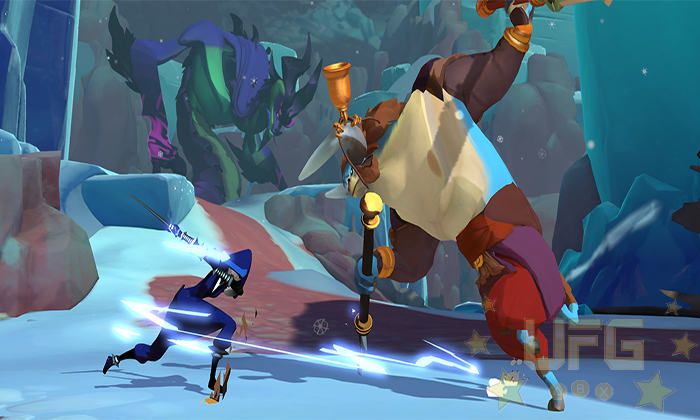 Gigantic’s rambunctious combat is entertaining. I wish the more strategic elements were better emphasized. With charming characters and vivid colors, the game oozes cartoon. The sound effects and music are decent. Gigantic has legs. As long as Motiga continues to update the game, I’m sure fans will stick around.